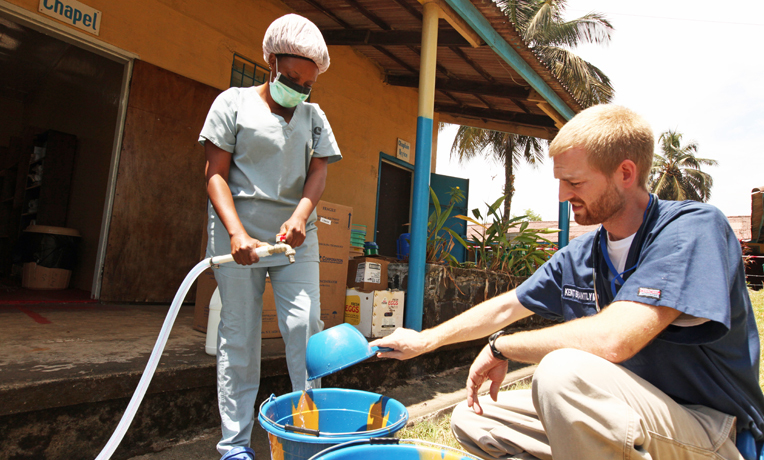 Dr. Brantly was serving with Samaritan's Purse in Liberia when he contracted Ebola. Plasma from the Samaritan's Purse doctor has been given to three Ebola victims. For the third time, blood donated by Samaritan’s Purse doctor Kent Brantly has been given to an Ebola victim in the United States. Dr. Brantly is the doctor who survived after contracting the deadly virus while serving with Samaritan’s Purse in Liberia. According to news reports, a plasma transfusion from him was given to Nina Pham, the Dallas nurse who caught Ebola while treating a patient who died of the disease. Earlier, Dr. Brantly donated blood for Ashoka Mukpo, an NBC News freelance cameraman who was also diagnosed with the virus, and Ebola-stricken aid worker Dr. Rick Sacra, who subsequently recovered. According to a story on NBC News, Dr. Brantly was contacted by the Nebraska Medical Center and asked to give plasma for Mukpo was on a road trip from Indiana to Texas. Dr. Brantly acted quickly after receiving a call telling him his blood type matched Mukpo’s. Within minutes, he stopped off at the Community Blood Center in Kansas City, Missouri, and his donation was flown to Omaha. Mukpo’s father Dr. Mitchell Levy was touched by Brantly’s intervention. “This act of kindness and generosity makes me believe in the goodness of humanity,” he told NBC News. READ MORE: In a visit to Samaritan’s Purse international headquarters, Dr. Kent Brantly tells staff to remember God’s goodness. Dr. Brantly contracted the deadly virus while serving in Liberia, where Samaritan’s Purse has ramped up its response to the unprecedented Ebola outbreak. The virus has already claimed more than 4,000 lives in West Africa, primarily in Liberia, Guinea, and Sierra Leone. The total number of cases is doubling every three weeks, according to health officials.